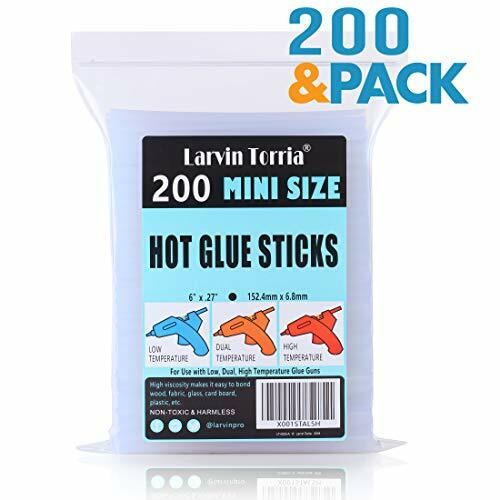 Mini Size Hot Glue Sticks, 200 Pack, 6” Length and 0.27” Diameter, High Viscosity and Transparent, Use with All Temperature Mini Glue Guns, Ideal for Art Craft, Basic Repairs and DIYs by Larvin Torria at Designers Artists. MPN: LT-GGS-A. Hurry! Limited time offer. Offer valid only while supplies last. ✅VALUE HUGE BULK PACK: The package comes with 200 glue sticks, not only cost-effective, but also don't worry about running out quickly. It's basically enough for your household gluing projects. ✅OPTIMIZED DIMENSIONS : 0.27" in diameter - fit for most mini glue guns. 6" in length - won't use up so fast and won't put in a new one so frequent. The glue stick's dimensions were tested many times. ✅USING PERFORMANCE: High viscosity makes it easy to bond wood, metal, glass, card board, plastic, etc. High transparency makes it look like crystal when melted, you can even read the text through it. ✅WIDE APPLICATION : For use with high and low temperature glue guns. Ideal for arts & crafts, basic repairs, homemade jewelry, DIYs, etc. Larvin Torria glue sticks are the crafter's preferred choice. ✅QUALITY INSPECTED: Each product has been checked, put under durability and functionality test before shipped. no compromise on quality! If you're unsatisfied with it, send it back for a full refund. If you have any questions about this product by Larvin Torria, contact us by completing and submitting the form below. If you are looking for a specif part number, please include it with your message.